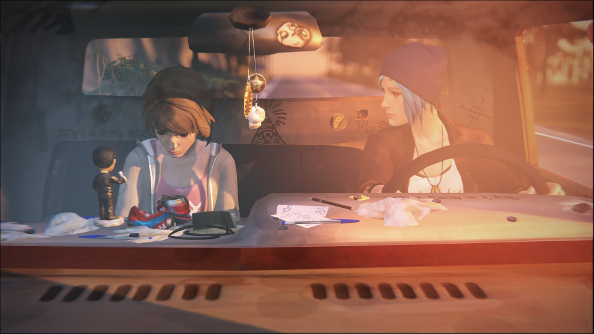 Yes, Life is strange. One moment, you’re a quiet photography student grappling with teenage popularity issues, the next, you’re Veronica Mars with the ability to warp time. That’s Max’s life, anyway. 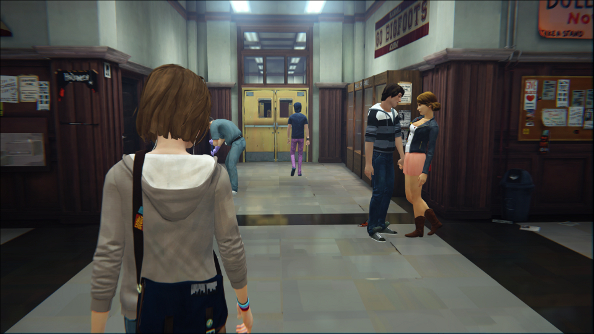 Life is Strange’s half-pint protagonist and amateur sleuth has all the problems of a teenage girl in a new school, with more piled on in the form of a newly-discovered ability to rewind time and a missing person to find. Adventure games: they never just give you one problem to deal with. Time travel needs restrictions. Step on a bug 100 million years ago, and suddenly, the world as you know it is transformed into a hyper-intelligent society of moss-based life forms. Kill Hitler as a baby, and the world gets conquered by infants. 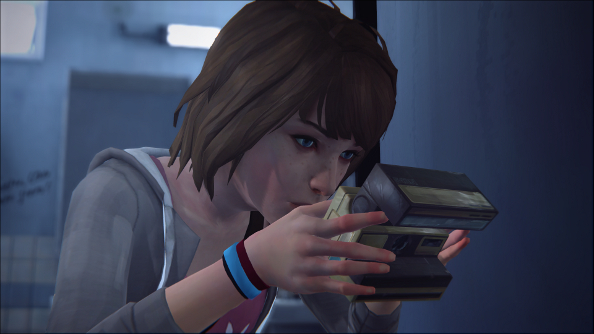 In Max’s case, she’s able to rewind time only to a recent moment – in game terms, this means a single scene. Leave the scene, and there’s no reversing it. Max discovers her powers in a toilet. Not literally inside a loo, but while she’s hiding in the school bathroom. It saves a life, which puts it rather high up on the list of things discovered in the same place where people defecate. Throughout the first episode, Max finds plenty of uses for her fancy new ability. 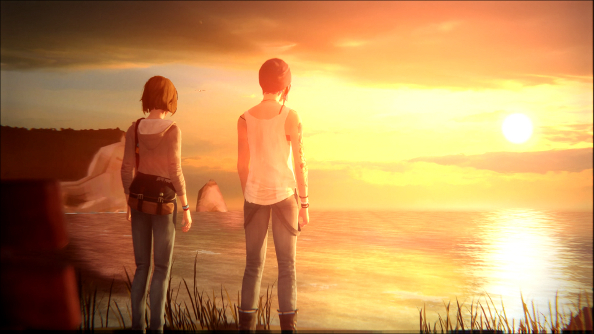 Life is Strange employs a consequence system not unlike those found in Telltale’s games, with Max’s responses to the people around her artsy academy leaving a lasting impression. But unlike Clem or Bigby, Max can rewrite history. When you have the power to reverse time, you don’t need to worry embarrassing yourself in front of a peer. Her powers stretch beyond being just a conversational aid, though. Broke a friend’s ornament? Rewind time. Ruined some documents? Rewind time. Didn’t hide quick enough? Rewind time. It’s handy, is what I’m saying. This potentially liberating mechanic, lamentably, is hobbled by an apparent lack of confidence in the player’s ability to know when to use it. Where time travel would come in handy, the game certainly lets you know it. Technically, it can be used at all times, but only in specific moments does the game deems it useful. Which is, in fairness, quite often, almost as often as choices arise. And there are consequences to these choices, even ones not rooted in time travel, creating confrontations and new problems that could have been avoided had another path been taken. It’s all a bit mundane, though. A significant portion of the game is taken up by Max attempting to make people like her by pretending to know things that she simply doesn’t know. She’s worried about being an outcast, but her fears make her a bit of a fraud. But it is, perhaps, not a million miles away from the lengths that a lot of people go to so they can fit in when they are still stuck in the prison of full-time education. Max does get to know people a lot better by bending the laws of physics. And really, that’s what the first episode is really about: fleshing out the world. There are incidental conversations, countless points of interest and little bits of Max’s inner monologue building a believable school ecosystem full of cliques, dances and petitions. With all that, it’s a slow build up. There’s a secret in the town, and a missing girl that nobody seems to be worried about, apart from Max’s childhood friend, Chloe. But by the end of the two or three hour episode, hardly a single stone has been upturned. Max asks a lot of questions, but doesn’t make much headway. It should be more frustrating than it is, but maybe I’m just a sucker for teen drama spliced with superpowers. I did watch three seasons of Smallville before I finally called it quits. It’s worth noting, however, that this is teen drama as written by someone who possibly hasn’t met very many teens. Dontnod is a French studio, so it might all be a bit lost in translation, but at its worst, the dialogue is more awkward than watching a 60-year-old man put The Boss on, don a bandana, perform some air guitar and then say, without a hint of irony, “I’m down with the kids”. No, Dad, you’re not. Yet you can’t entirely cringe, because it’s a bold, bright and striking game. Dontnod really do know how to frame a scene. I wore out my F12 key taking so many damn screenshots. 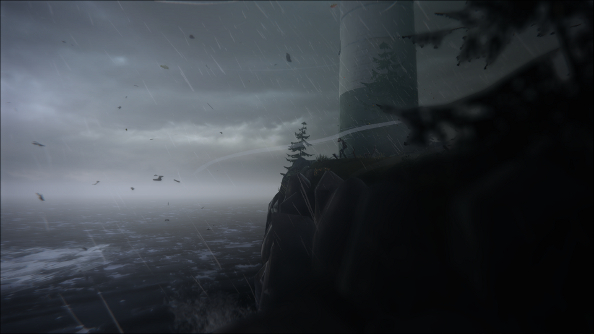 It’s not just a game about a young photographer, but a game that revels in trying to find that right angle, the best way to present emotion without words. Clever audio design helps. It’s Max’s soundtrack, her playlist. It’s the music she’s listening to, or even playing herself. We’re hearing something personal. And it’s during those moments where the game starts to open up. The doubts I was having thanks to the shaky writing were swept away during the first episode’s closing scene, where all the strengths of this first episode collide in an affecting conclusion that brings it full circle. 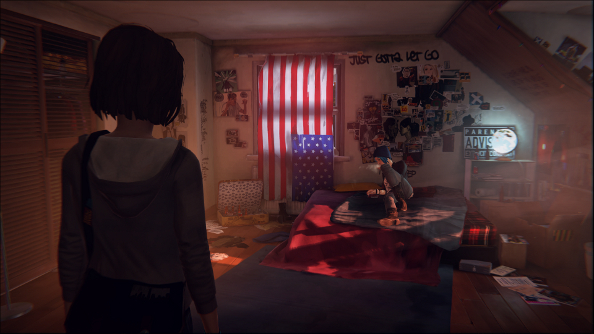 After quite a bit of meandering, Life is Strange offers revelations, along with dialogue that isn’t trying to ape how a teenager might sound. Or maybe the awkwardness is just drowned out by Chloe and Max’s sincerity. And, in the tradition of all good TV pilots – it owes as much to TV and cinema as it does to other games – there’s a cliffhanger that’s going to force me to come back.